The actual value for radiation resistance is likely to be with -50-+100% of the free space value used, and that rolls up as an uncertainty of +/-3dB in the calculated efficiency and gain. For example, Duffy (2014b) analyses the Chameleon M loop. Based on the larger diameter of the conductor (25.4mm) and smaller loop perimeter (2.873m), we might expect it to have a loop inductance of around 61% that of the LNR Precision loop. Lower inductance is one of the factors of the equation for Q, and for half power bandwidth. The smaller loop of larger diameter conductor will tend to have lower Q, wider bandwidth, all else equal. You cannot simply infer relative efficiencies of these antennas based on half power bandwidth alone… any competent antenna designer knows that. Above is the result of a more complete estimate of efficiency that includes not only half power bandwidth, but loop perimeter and conductor diameter. The estimated efficiency at 0.88% is significantly lower than a similar estimate for the LNR Precision loop, some 5dB lower but measurement of field strength from both loops in a relevant setting is the best way to compare performance. One could be forgiven for thinking that the market for these type of antennas are hams who aren’t much concerned with efficiency, but there remains a small number of hams interested in the technology of radiocommunications. Based on measurements published by both suppliers, it is likely that the LNR Precision loop is significantly better than one of its competitors, the Chameleon M-Loop, but the difference between them cannot simply be inferred from the bandwidth measurements of each. 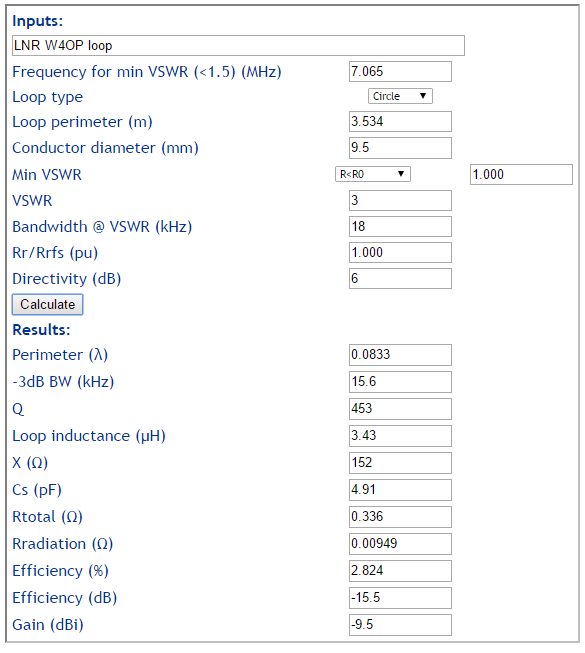 The calculator Calculate small transmitting loop gain from bandwidth measurement which captures most of the relevant factors, properly applied may provide the basis of a useful comparison between different implementations. Chameleon. Oct 2014a. CHA M-LOOP Analysis. http://chameleonantenna.com/resources/CHA_M-LOOP_SWR_ANALYSIS.pdf(accessed 30/11/2014). Chameleon. 2014b. CHA M-LOOP. http://chameleonantenna.com/PORTABLE%20ANTENNA/CHA%20M-LOOP/Chameleon%20M-LOOP.html (accessed 30/11/2014). Duffy, O. May 2014. 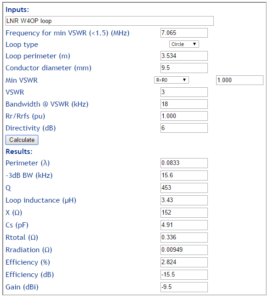 Small transmitting loop calculators – a comparison. https://owenduffy.net/blog/?p=1693. Duffy, O. Nov 2014b. Chameleon CHA M-LOOP. https://owenduffy.net/blog/?p=2999. Milazzo, C. May 2015. 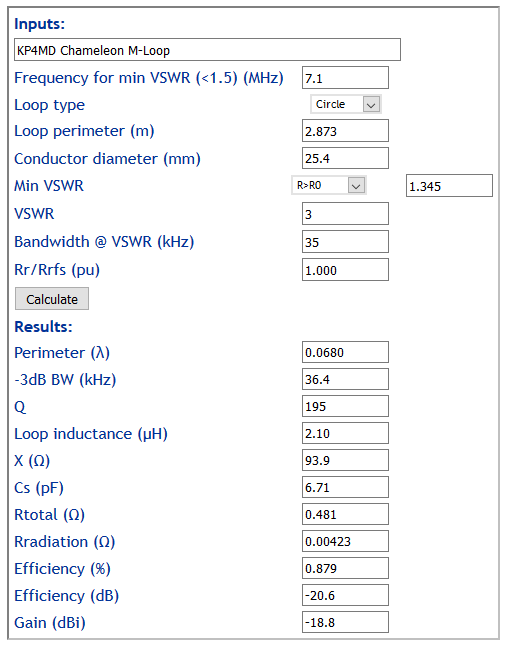 Chameleon CHA F-Loop Antenna Parameters: 5-30 MHz. http://www.qsl.net/kp4md/chafloop.htm. Yates, S. April 2009. 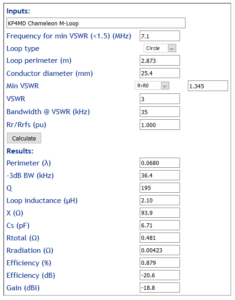 Small Magnetic Loop Antenna Calculator ver. 1.22a.